NEW ORLEANS – In March, the Arkansas women won their first ever indoor track & field national championship. This weekend, they finished their third SEC triple crown—winning the conference in cross country, indoors, and outdoors in the same school year. And in June, they’ll look to win their first ever NCAA outdoor title. Per the rankings released Monday by the U.S. Track & Field and Cross Country Coaches Association (USTFCCCA), they’re currently favored to do so. The Razorback women are ranked No. 1 for the third straight week. After Texas A&M spent the first month of outdoors in the top spot, and USC took it for a quick week, Arkansas’s women are now firmly in control. Dominique Scott, Sandi Morris, and company are ranked No. 1 for the third straight week. These are the last set of rankings based on the descending order lists. Next Tuesday’s rankings will be based on the entries for the NCAA preliminary rounds, and the final rankings—coming out Monday, June 1—will be based on the qualifiers to the NCAA finals. Fields for the preliminary rounds will be announced Thursday afternoon at 1:00 PM Eastern. Three of the four teams following Arkansas in the women’s top five did not win their conference meet this past weekend, underscoring two things. First, the SEC and PAC-12 are incredibly deep. The top eight men’s teams and eight of the top nine women’s teams comes from those two conferences. Second, there’s a big difference between the type of team you need to place well at a conference meet and the type of team you need to place well at the national meet. Arkansas is the rare squad that is constructed for both. 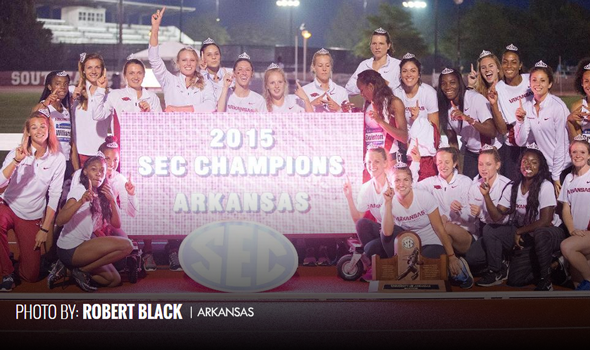 Three Razorback women delivered # SEC championships this weekend. They were Taylor Ellis-Watson in the 400, Scott in the 1500 and 5000, Diane Robison in the 10000, Jessica Kamilos in the steeplechase, and Morris in the pole vault. Morris’s winning mark of 4.72m (15-5¾) is a new collegiate record. That’s her second vault record of the outdoor season and third of 2015. No. 2 Southern California lost to No. 3 Oregon at the PAC-12 championships despite the latter losing Jenna Prandini for the weekend, but the Trojans remain the higher ranked team for another week. The Ducks made the biggest jump in the top ten and added the most rankings points of any team in the top twenty-five, thanks to season bests from mid-distance runners Raevyn Rogers and Annie Leblanc plus a host of SBs in the field. No. 4 Georgia and No. 5 Kentucky did not have the team depth to crack the top two at the SEC meet, but they might have the star power to stand on the podium at NCAAs. At SECs this weekend, Georgia had Keturah Orji win the triple jump, Freya Jones take second in the javelin, Leontia Kallenou take second in high jump, and Kendell Williams take second in the heptathlon, all in season bests. Kentucky’s finest performance of the weekend came from Kendra Harrison, who ran 12.50 to become the third fastest 100 meter hurdler in collegiate history and the second fastest in the world this year. Harrison had help in getting the Wildcats back into the top five, though: Dezerea Bryant, Sha’Keela Saunders, and their 4×100 meter relay all set nationally elite season bests in Starkville. Oregon and Kentucky joined the top five at the expense of No. 6 Texas and No. 7 Florida, who stayed ahead of No. 8 LSU, No. 9 Texas A&M, and No. 10 Kansas State. One women’s team joined the rankings this week: No. 22 Oklahoma. With the regular season in the books, today’s regional indices are the final ones of 2015. Leading their respective regions are Michigan State (Great Lakes), Penn State (Mid-Atlantic), Kansas State (Midwest), Texas Tech (Mountain), Harvard (Northeast), Florida (South), Arkansas (South Central), Kentucky (Southeast), and Oregon (West).